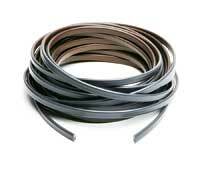 The Q-Wire is a series of flexible, watertight cables that can be used for direct burial applications to power low voltage landscape lighting. It is a flexible, stranded type of cable that can be used effectively for low voltage indoor and outdoor lighting. Two tinned copper insulated conductors lay parallel within an overall jacket. Q-Wire is UL Listed, watertight, sun resistant and tin coated so it won't oxidize. It also uses a two-color outer jacket: Brown on one side to blend into the bark of a tree and Dark Gray on the other. Stranded conductors are jacketed inside the UF outer jacket and color coded in Bright Blue and Bright Yellow.